Hiking the Storied Storm King Trail! On a sunny Saturday in early January, Troop 353 went on an invigorating winter hike. Our destination was Storm King State Park and our goal was to hike the scenic Storm King Summit Trail. The hike was part of the various “homecoming” activities the troop planned for its former Eagle Scouts that weekend, which also included an Eagle Project and a “show’n tell’ slide show of historic high adventure trips at our Sunday night troop meeting. The weather was cold, but our hikers were amply prepared with layers of winter clothing. Fortunately, the sun was out all day and it heated up as the day unfolded. Still, given the recent snowfall, we had some concerns about icy conditions on the trail. Fortunately, a park ranger pulled into the parking lot and informed us that by staying on the south side of the mountain on the Orange, upper Yellow Trail we should avoid most of the mud & ice found on the lower portion of the Yellow trail on the north side of this infamous mountain. Interstingly, these trails are part of the much longer Highlands Trail with its distinct Teal trail blazes that link several state parks on the western side of the Hudson River. Storm King has a very interesting recent history. In 1999, under drought conditions, a forest fire spread throughout the state park. In the course of extinguishing the fire, exploding ordnance were unexpectedly discovered. “The ordnance had apparently been fired well over a century ago to test cannons manufactured at the West Point Foundry in Cold Spring, across the river and it exploded due to the heat generated by the fire. Subsequently, it was determined that artillery shells fired from the West Point Military Reservation may also have landed in the park.” It took the U.S. Army Corps of Engineers over 4 years to clean up the park before it was reopened to the public. There are actually two adjacent mountain peaks that our troop hiked and the vertical rise is a manageable 500 feet (or less) and we probably hiked only 2.0–2.5 miles in total. From the top of Butter Hill, only 45 minutes from the parking lot, one can view the Shawangunk Ridge to the west (and several major Catskill wilderness areas), Mount Misery to the South, West Point and Cold Spring to the Southeast and the easterly ledges of Storm King. Then a short walk north to northeast over to the Storm King mountain along the upper Yellow trail, gives hikers unparalled views of the Hudson River to the north and the east. Directly across the Hudson River to the east is the equally scenic Breakneck Ridge trail, towering above Cold Spring, NY, which the troop hiked last April. There are no fewer than 7 different scenic view points on the trail map. At one of these points, the boys picked a perfect place to stop for a late lunch and a brief 30-minute rest. In the distance, one can easily view Bannerman’s Island and the remnants of the Scottish-style castle he built in the late 1880s to house his arsenal of second-hand military supplies which he sold abroad. Afterwards it was a comparatively quick jaunt for the scouts down the White / Bypass trail. This was a comparatively easy hike with varied geographic conditions and stunning views which scouts and scouters alike greatly appreciated as seen in these pictures [click for more]. 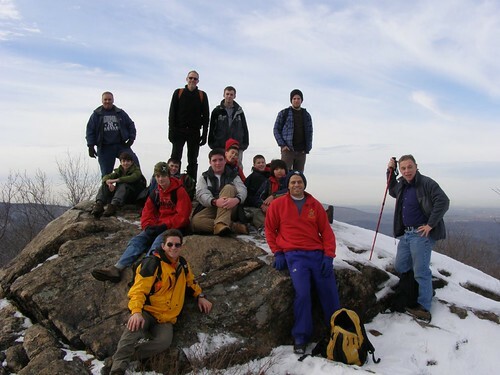 Author scoutmasterPosted on January 30, 2008 March 26, 2008 Categories Activities, Advancement, Events, Hiking, PhotosLeave a comment on Hiking the Storied Storm King Trail!